9th July 2017 – In the stadium that will host the IAAF World Athletics Championships next month, Sir Mo Farah (GBR) and Hellen Obiri (KEN) had the perfect dress rehearsal. 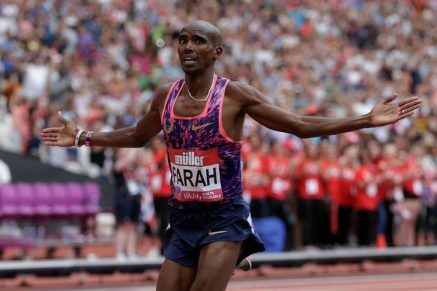 Sir Mo was once again very accomplished in how he went about his 3000m race. Sitting off the early pace, taking closer order as the race wore on, moving into the lead with 800m to run and then kicking hard off the final bend to the delight the home fans who were roaring him on, and crossing the line first in 7:35.15 seconds. Making his European debut Frankline Ngelel (KEN) was sixth in 7:38.50. Hellen cannot stop setting national records at present. Having already broken the Kenyan record for 3000m indoors and 5000m outdoors this year, Hellen tackled the 1 mile distance with the same outcome. Tracking her British rival Laura Muir all the way, Hellen again kicked hard as they entered the final straight and decisively moved away to win and set new figures of 4:16.56. Two more PB’s were set by Winny Chebet in third (4.19.55) and Steph Twell twelfth (4:25.39). Two more athletes to set personal bests were Fred Kerley (USA) and Shamier Little (USA). Fred, who was making his professional debut here stepped down from his usual 400m (where he has already won the US National title and US Collegiate title this year) to the 200m. He pushed the half lap specialists very hard and was rewarded with a second place finish and a time of 20.24 seconds. Shamier also moved away from her favoured event, the 400m hurdles to contest the flat 400m. No one would have known though as she finished very strongly to take third place in 50.40 seconds. Vincent Kibet (KEN) was unlucky to just miss out on victory in the 1500m, taking second place in 3:34.88. Bethwel Birgen (KEN) took sixth. Laura Roesler (USA) and Andrew Osagie (GBR) were both involved in hotly contested 800m races. Laura was seventh in the women’s event and Andrew ninth in the men’s. The previous evening in Sotteville Perri Shakes-Drayton ran a seasons best of 52.37 seconds for the 400m as she took second place.